PEROU – Caral - Caral continues to yield surprising finds for archaeologists, even 19 years after it was first discovered.Peruvian archaeologist Ruth Shady discovered Caral in 1994. 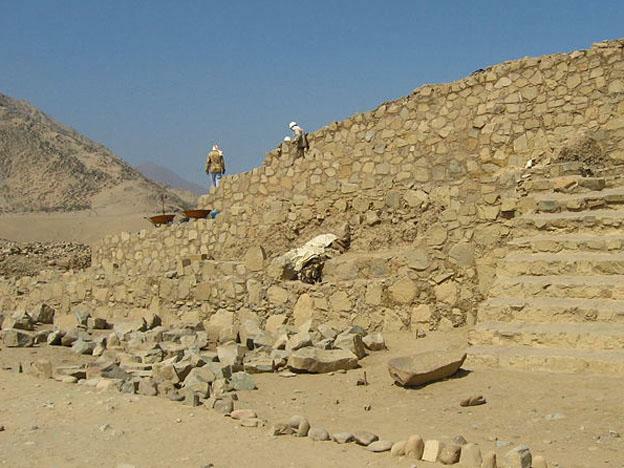 Caral, which was inhabited between 2,600 and 2,000 BC, is located approximately 200 kilometers north of Lima. As part of the nineteenth anniversary since its discovery, a number of cultural activities were held at Caral this weekend. Another cause for celebration at Caral this weekend was the inauguration of the Museo Comunitario de Supe, where El Comercio reports that visitors will be able to learn about the ongoing investigations into the Caral archaeological site. And even 19 years after investigations first began at the site, archaeologists are still making new finds. Efe reports that a road connecting the prestigious center area of the city to the more modest outskirts was discovered recently, as well as the remains of a small public building on the edge of the city. According to Shady, Caral may have ultimately met its demise because of a phenomena that we often think of as solely modern: climate change. Efe reports that Periods of flooding and drought rocked the land, and were accompanied by intense earthquakes. GRECE – Lac Karla - A farm-house, a Neolithic settlement, an inn, a ceramic furnace and scores of artifacts were discovered by archaeologists at Lake Karla located in Thessaly. These discoveries were made during the excavations which aimed to turn the lake into a main water reserve. According to official reports, the archeologists uncovered a big farmhouse at “Tserli” which is aged from the Hellenistic period (2nd Century BC) which has many rooms and some 500 artifacts, a Neolithic settlement enclosed with a yard and scores of artifacts and later Neolithic sculptures at Amygdale 1. In the region named Amygdale 2, they have found a farm-house which also has a ceramic furnace aged from the Hellenistic period which was used as an inn. They also discovered a stone wall, a desk, graves and a fascinating construction of a square aged at the Mid Bronze Age at Amygdale 3. The Central Archeological Council said that, the farmhouse at “Tserli” with its rooms and its yard will be preserved on-site. The archeologists also stated that the findings which will not be affected by the bad weather and the water can be added into the naturalist promenade in order to make it larger and more interesting for the tourists. The rest of the monuments will be placed in the museum. TURQUIE – Çiçekdağ - Male bones in 23 graves dating back to 1,500 years ago have been found during archaeological excavations in the central Anatolian province of Kırşehir’s Çiçekdağ district. 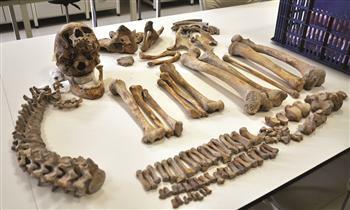 The bones are being examined at the Ahi Evran University (AEU) Anthropology Department’s laboratory and experts are researching as to why there were only male bones in the graves. Associate Professor Ahmet Cem Erkman said the Çiçekdağı district dated back to the early Byzantine period and they have been excavating the area for two years in and around a bath. He said that many stone sarcophaguses were found during the excavations and they were the home to 14 adult men, six children and three baby boys’ bones. He said it was interesting that all of the bones were male bones.